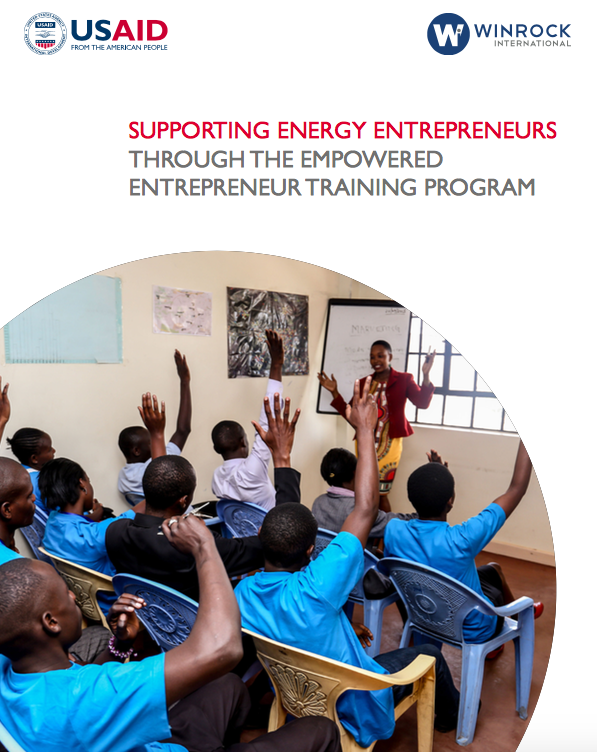 Through the USAID-funded Developing a Sustainable Cookstove Sector project,Winrock International, in part- nership with Johns Hopkins University (JHU) and the Visionaria Network, is rolling out Empowered Entrepre- neur Training Programs (EETPs) to help strengthen entrepreneur capacity throughout the clean energy value chain.These programs use the Empowered EntrepreneurTraining Handbook curriculum,which builds key business, empowerment and leadership skills. Developed by JHU and the Visionaria Network with support from the Global Alliance for Clean Cookstoves, this unique curriculum focuses on agency-based empowerment, which enhances an individual’s capacity to create and focus on goals, and take advantage of opportunities when they arise. A randomized controlled trial conducted by JHU and implemented by ESVAK Kenya found that women entrepreneurs who received the agency-based training sold nearly three times as many improved cookstoves as men. Men and women getting the enhanced training were 2.7 times more likely to be high sellers, and wom- en and men who received the agency-based empowerment training were twice as likely to pursue sales leads and continue their business activities when faced with challenges. Although developed for use in the cook- stove sector, the curriculum is also applicable to entrepreneurs selling other technologies. EETPs aim to enhance the agency and abilities of local entrepreneurs, especially female entrepreneurs, so that they can create viable businesses and scale clean cooking and energy solutions globally.The trainings build in- house expertise at local businesses involved in the cookstove value chain so that they can create empowered entrepreneurs with strong business and leadership skills.